I started reading Michael Pollan when he was a columnist for the New York Times, lived in Connecticut, before his first book. I read everything he put out the minute it went out. He and Kingsolver really got into food and farming, connecting the dots, at the time when we needed a little validation of the path we were already on. We’d already started with bees, had just gotten a flock of sheep. Then chickens. Then working dogs. Before you know it, we’d added geese, ducks, turkeys and oh my god pigs. I was reading about grain fed critters because though every shepherd around told me to teach my sheep to come to the rattle of grain and we adopted the Red Scoop of Joy, my animals acted crazy addicted, obnoxious and aggressive, and with the horses, feeding grain was really scary. Prince almost killed me several times, and Pearl would step on Polly her baby to get to grain. We had Minx nearly kill herself with a grain overload. Screw that. Ruminants do NOT need grain. They are so much better behaved for us when they never EVER get grain. When we were considering getting pigs, we went to a NOFA-VT grazing conference, and listened to how “organic farmers” were raising pigs. Most of them were putting a one-ton feeder full of grain, and letting them free-feed on that. They’d get some forage as well, and when the feeder was empty, it was time to either move them to the next area or send them off to freezer camp. Wow. That wasn’t what we wanted to do at all. We wanted critters who would forage for a good part of their diet. We had land we wanted them to clear. No free rides here. We find them lots and lots of other foods to eat, stuff that we forage from the food waste all over our food shed. They feast on yogurt, avocados, apples shipped from California and windfall apples from neighbors. (and weeds and grass clippings) It’s as wide a variety as we can imagine and we feel like we’ve failed them when we must resort to some bought grains. Anyway, what I’m saying is when he summarized his philosophy with eat food, not “food”, it helped us crystallize our philosophy, not only about our own diet, but about how we feed our animals. Our sheep get mighty tired of asparagus in the spring in our region, especially once they are slimy and stinky, but how many sheep are eating green things in January? Frozen is fine, thanks. 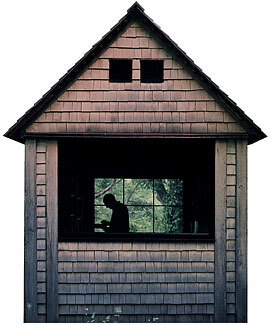 I’ve wanted to build a cabin based on the writing space he built in A Place of My Own. Frank was absolutely outraged that he would ever build something 8’1 high. He thought that was a spectacular waste of perfectly good wood. I told him we could sell kits to yuppies, because we had our own sawmill. Hell, I still think that’s a good idea. It’s a cute space! Wouldn’t you like to visit a working farm and stay in something that adorable? So thanks, dude. We hope you have a grand birthday. This entry was posted in Critters. Bookmark the permalink. Post a comment or leave a trackback: Trackback URL.